Today being Pancake Day, I thought I'd share my recipe for oat pancakes. They are really tasty, very cheap and also ideal for people who have to avoid flour, eggs or milk in their diets. They are vegan, too. All they contain are oats and water plus oil to fry them in and some sugar or other sweetener to go on top. I came up with the recipe when I was a poor student. Although I wasn't a vegan or allergic to flour, eggs or milk, I was looking for cheap food and found I liked them so much I still make them today. I do apologise that I don't have amounts listed against the ingredients as I just put in what looks right. First you put some oats in a jug and pour enough cold water on top to cover them. Then you leave the oats to soak in the water for a couple of hours until they are very soft. Heat some oil in a frying pan. 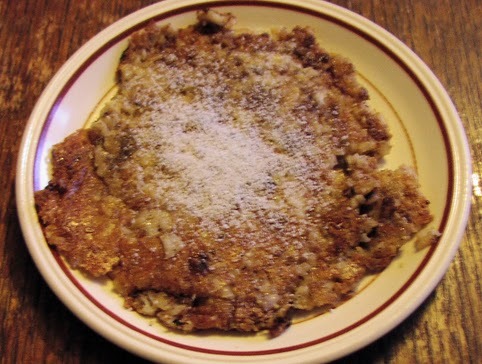 You need quite a bit more oil to cook oat pancakes than regular ones. When the oil is hot, ladle in a good dollop of the soaked oats mixture and then spread it out in the pan to form a thick pancake. Fry it until the oats have formed a solid shape, which they will eventually. You can agitate the pancake with a spatula while it is cooking to stop it burning. When it is solid, carefully turn it over in the frying pan using the spatula to cook the other side. You can slide the pancake onto a plate when it is fully cooked and golden brown on both sides. Sprinkle sugar or other sweetener on top, then enjoy! The pancake in the photo was made with muesli rather than oats.